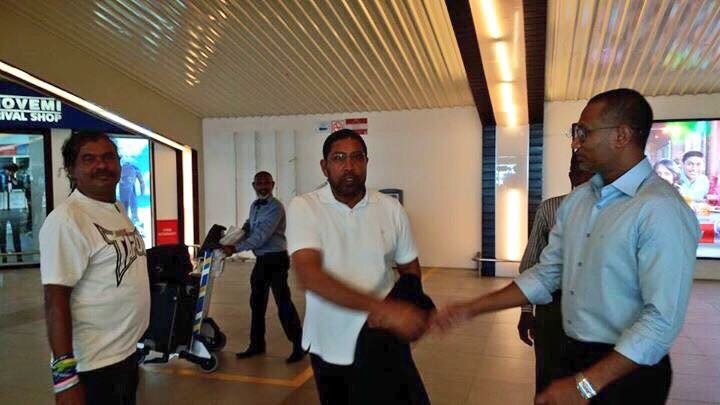 Gasim Ibrahim, the leader of Jumhooree Party (JP) returned to Maldives today after the government removed a freeze on his Villa Group accounts over an alleged unpaid fine of US$90.4million. Gasim spent nearly three months abroad, during which he announced he will resign from politics after his term as Maamigili MP expires in 2019. He has now pledged to hand over the reigns of the JP to new leaders. “Gasim did not mention any particular reason for coming back. But I note there isn’t any reason for him not to come back,” JP spokesperson Ali Solih said. The JP split from the ruling Progressive Party of the Maldives (PPM) coalition in January and allied with the main opposition Maldivian Democratic Party (MDP) in an anti-government campaign. MDP leader and former president Mohamed Nasheed was subsequently arrested and imprisoned on terrorism charges and Gasim’s Villa Group was slapped with a US$90.4million fine. The Villa Group maintains the fine is unlawful. However, the JP and the government said they have reached an agreement on paying the fine. Local media reported that the police had issued an arrest warrant for alleged funding of a historic anti-government protest on May 1. He was also accused of involvement in a plot to assassinate President Abdulla Yameen during the trial of ex defence minister Mohamed Nazim on weapons smuggling charges in March. Explaining Gasim’s silence on Nasheed and Nazim’s sentencing, JP deputy leader Ameen Ibrahim said the government had “economically – paralyzed” Gasim. Since then, Ameen and JP council member Sobah Rasheed were both arrested and charged with terrorism. The pair have now fled the country. Gasim was first in Bangkok, and later in Frankfurt. MDP chairperson Ali Waheed, who was arrested along with Ameen and Sobah, tweeted a photo of Gasim’s arrival at the Malé airport saying: “The picture says it all. This is not fair. President Yameen should remember a time will for others as well”. Waheed is in the UK. While Gasim was abroad, he backed several government proposals, including a constitutional amendment that will disqualify him from running in the 2018 presidential elections. The amendment sets new age-limits of 30-65 years for the presidency. Gasim will be 66 in 2018. The JP accepted President Abdulla Yameen’s invitation for talks without conditions. The JP and the government have held two meetings so far. Talks are ongoing between the MDP and the government now. One day man says that in President Yaameen's government, he is ready to do a toilet cleaner's job! Next day the man says President Yaameen does nothing else other than trying to bring him down on his knees! Now today, though being the leader of the third largest political party, he is arriving the country after nearly 3 months; physically changed, without any aroma or nothing! Wonder what could be next! It may never be impossible that he will spend in millions for the 50th anniversary of independence, eat malted sugar, do a jig and jive and then complain, "President Yaameen has done this; President Yaameen has done that"